The Knitting Pirate » In Which the Pirate-Husband Inkles. « In Which the Pirate Tallies. In Which the Pirate-Husband Inkles. 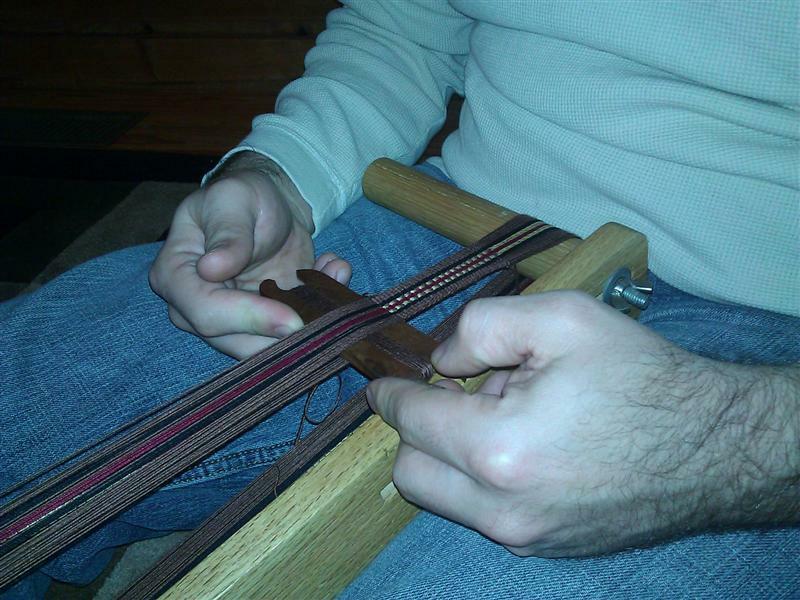 Several years ago, one of my friends in the SCA gave me an inkle loom. I bought a couple of books and swore that I'd learn to weave, and then... well, I didn't. This past summer I picked up a set of cards for tablet weaving, which can be done on the same loom, and re-promised myself that I'd learn to weave. Pirate-Husband seemed interested too, so over the holiday weekend we warped the loom for our first attempt at weaving, and then got to it! On Friday night I read through the instructions about warping while Pirate-Husband picked the colours and pattern that he wanted to use. We made a bunch of heddles, and then I kept track of the pattern while he did the warping. We used size 10 crochet thread for the project, and the balls of thread were too large to fit through the heddles, so we had to wind some off. First we tried using my ball-winder, but the ball collapsed in Pirate-Husband's hand twice and we lost a lot of time to untangling. Eventually we did some math and wrapped the warping yarn around the shuttle, which was time-consuming but worked much better. We got so into it, and so determined to finish, that we didn't realize how late it was getting. Even though he would have started weaving right then and there, we decided that three o'clock in the morning was a good time to stop and go to bed. Inkle weaving creates a warp-faced fabric, one in which you can't see the weft threads at all except for a tiny bit on the selvedges. 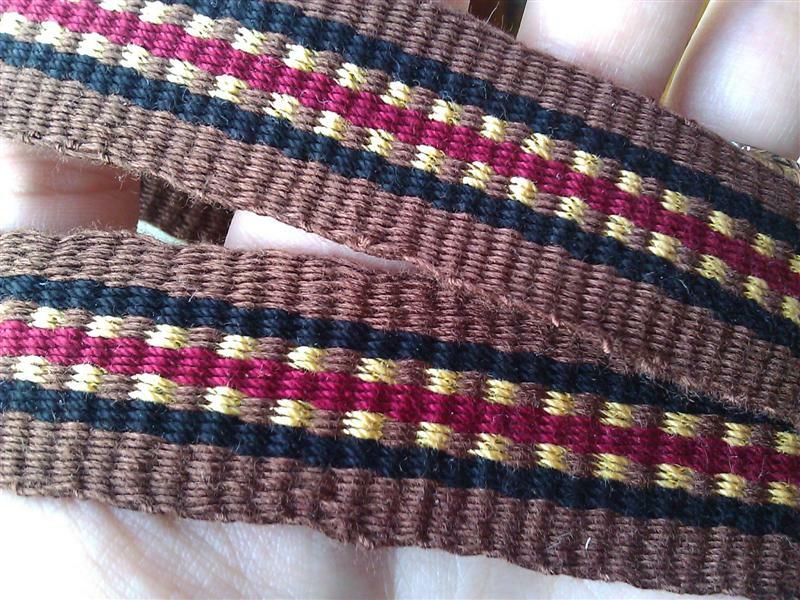 Since the sides of the pattern we chose were brown, we used the same brown thread for the weft, and it comes out to be almost completely invisible. He got started on Sunday night with the football game, and was making such good progress with the weaving that I asked him to slow down and leave it unfinished to show my parents, who were coming over on Monday for the afternoon and dinner. I knew Dad would get a real kick out of the loom and seeing us weave, and I was right. Pirate-Husband wove through the afternoon while we all watched. We had a good discussion about the meditative nature of hand-work like weaving and knitting, and how much better we feel when we're being either meditative or creative, but both at the same time is an extra good thing! It wasn't long before he was done, and pretty soon we we'd cut the band loose and were tying off the fringes. The strap has 67 ends; it came out to be an inch wide, and nine-and-a-half feet long. I think the total time was about ten hours, but the next piece will definitely go faster as we won't have the same troubles with the warp tangling - and we shouldn't have to make more heddles, either. A thicker piece could probably be done in half the time! He is going to use this piece as trim on SCA garb, and of course we've already made plans for several more projects. I want to make a piece that I can sew d-rings to and use as a belt with jeans, one to use as a much longer belt for my SCA dresses, and then I want to try fancier designs with tablet weaving. Pirate-Husband wants to make a heavier utility strap in simple dark colours that will have a multitude of uses. It's only a few days into the new year and we've already learned a new skill. How cool is that? 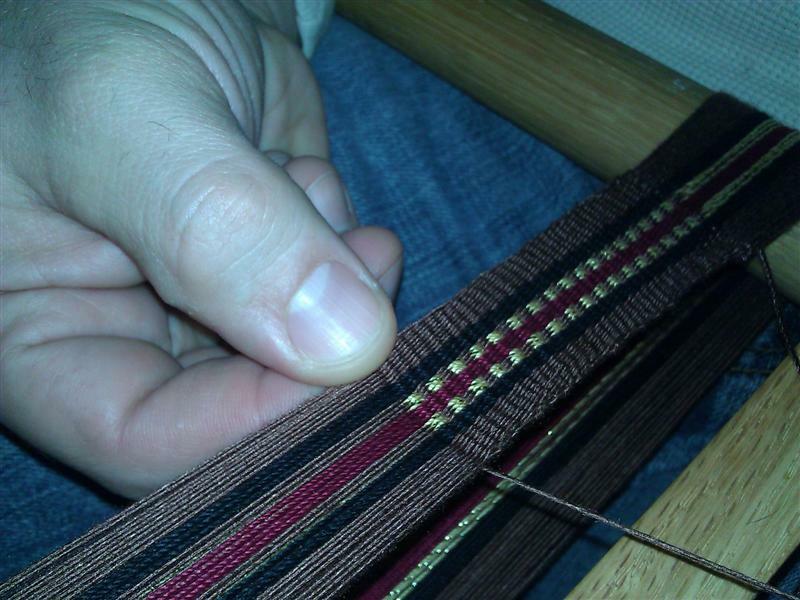 This entry was posted on Tuesday, January 3rd, 2012 at 13:53 and is filed under inkle, weaving. You can follow any responses to this entry through the RSS 2.0 feed. Both comments and pings are currently closed. Ah, excellent idea! We made them the right height but not doubled, so once they were on... they were on. Guess we'll have to remake them one more time! Eadwyn - That technique worked really well. I am working on a middle eastern-ish strap with bulky yarn and being able to pass the full skeins around really sped up my stringup time! I got the loom set up and half the strap done in ~4 hours. I am sure new pics will be posted soon.